Nuclear weapons plants--Environmental aspects--Washington (State)--Hanford Site. Robert Bauman: All right, is that all right? Bauman: Okay. All right, we can go ahead and get started. Bauman: And if we could start first by maybe having you say your name and spell your name for us? Johnson: It's Norman Neil Johnson. J-O-H-N-S-O-N.
Bauman: Great. And my name's Robert Bauman. We're conducting this oral history interview on November 5 of 2013. And we're doing this interview on the campus of Washington University Tri-Cities. So let's start maybe by having you talk about your family, first, and what you know about when they came to the area here. Johnson: My grandparents--I can remember my grandpa telling me--he came out here in 1910 and bought land. And then he moved back to Idaho. He was working in the sawmills in Idaho. And then he come back in 1918 and brought my grandmother and my aunt and my mother back. And they started farming in 1918. Bauman: And his name was? Bauman: Pete Hanson. Do you know why this area, why Richland? What brought him here? Just the availability of land? Bauman: Four years old. So she grew up here. Johnson: Yeah, I was one in Lady Lourdes Hospital in Pasco in 1936. The only hospital here. Bauman: Okay. And what about your father, then? Johnson: I think he was from Republic, Washington. Somewhere over there, because--I was so young when he died, that I never really knew much about him. And I didn't think to ask his brothers or sisters about him. Bauman: But did he live in the area too, you and is that how your parents met? Johnson: Yeah, mm-hm, yep. He had an older sister that lived here, too. Their name was Perkins. There was quite a few of them. Bauman: Mm-hm. And you were born in what year? Bauman: 1936. And your family had a farm? Bauman: And what sort of crops? Bauman: And do you know about how large the farm was? Johnson: He had 17 acres and then he farmed my mother's 10 acres, so he had 27 acres all together. Bauman: And do you remember any other buildings on the property? A barn, storage buildings? Johnson: Yeah, we had--there was a storage building right behind our house. It was maybe 40 feet from the rear of our house. We always called it the other house, and I think it had been actually a residence of somebody's at one time. But I don't know when. Bauman: Okay. And do you know roughly where the farm was? Johnson: As I recall it was about five miles from downtown Richland. And it must have been at least a mile off from the river. Bauman: And did you have electricity on the farm? Johnson: We got electricity just before I was born, but my cousins that live next to us they never did. They didn't get electricity. But we had it just before I was born, I guess. Johnson: Nope. No, we didn't have any of that. Bauman: And how about irrigation? Johnson: We had irrigation water, yes. Johnson: It's real irrigated, is what they did. They had a concrete pipe that run at the head of the field. And it had little holes in it. And then they had cedar plugs that they put in it. And when they wanted the water rail, they took that plug out, and away it went. Bauman: Do you remember who your nearest neighbors were? Johnson: Well the Brewers were the closest. They was the ones that was my mother's cousin. Bauman: So what do you remember about the area from the time you were growing up here? Johnson: Not a whole lot. I remember a few things. I remember when they shut our water off. They shut all our irrigation water off. The government did. And so we couldn't irrigate anything, so my grandfather went to work. As I recall it was up in big Pasco for somebody--when they were building the warehouses over there. And just me and my grandmother there. And my mother working at the post office. The government brought some prisoner of war out there, and just left them. Know what they did, they had them doing something out there. I remember my grandmother was really worried about the Italians, is what they were. And that would have been in like '43 or '44. Something like that. Bauman: Okay. So did you go to school in Richland? Johnson: I went to the first and second grade. First grade we went all day. But the second grade, the population had grown so much that we had two shifts, and I had the afternoon shift. And that was only time I went to school in Richland, was the first and second grade. Bauman: Okay. So was second grade like 1943, '44, or something? Johnson: Yeah, it must have been the '43, '44 year, yeah. Bauman: Do you remember anything about the school itself? The building or any of the teachers? Johnson: Yeah, seemed like it was over there where Lewis and Clark is now, I think. It was the only school there. Seems to me like it was a long building on one end, as you started at--it would've been the north end--the first grades, and then as you walked farther the other away the grades went up. I don't know how far they went. It might have been high school on the other end. I don't know. But I know I had cousins that went on the other end, and they were like five and seven years older than me. And they went up in the other end of the building. Bauman: And how did you get to school? Was there a school bus? Johnson: Yeah, a school bus. Bauman: Was it a fairly standard sort of the school bus? Or what would you think of the school bus now? Johnson: Well, probably not as good school buses now, I don't imagine. No, no, nothing like that. But I don't remember what they were like. Bauman: Okay. So you went there, you said first and second grade. And what happened then, after second grade? Johnson: Well that was when my grandfather was building a house in his spare time over in Kennewick--500 block on Rainier. And when he got it done, that summer of '44 we moved over there. I think that we went back to the farm one time, just to look at it. And remember my grandfather telling me he wanted to buy the building, the house, and move it to Kennewick, and they wouldn't sell it to him. He was not happy about that, either. What they did with it, I don't know. Bauman: So you were able to stay in the house into 1944? Bauman: But then you had to leave? Johnson: Well, we did. I don't know if they were actually forced to leave at that time. But we did. When my grandfather got the house finished in Kennewick, we moved over there. Bauman: And do you remember when the government started sort of moving in? Do you have memories from that period? Johnson: At the time before they moved in my mother was working for the irrigation department, for Mr. Fletcher, I think he run the irrigation department. And she said they had heard something was going on-- something was going to come here, and they didn't know what. And I imagine that would have been in probably '41 or '42. And of course that job went away when they shut the water off, so she went to work for the postal department in Richland. Bauman: Oh, okay. But you don't know if your mother or grandparents ever got a notice saying you have to leave by a certain time? Johnson: I think did, yeah. I don't know if they ever said right out that you had to leave at a certain time. But they were condemning our property, is what they called it. They were all farms. They shut the water off, there was no reason to stay there anymore. Because it's pretty arid out there. Bauman: Do you have any memories of the--I know you lived outside of town itself, but did you go down very often? Do you have any memories of the town itself? Johnson: Yeah, I used to go in with my grandfather and get groceries. And he had a '36 Ford pickup, and he'd let me sit on his lap and steer. I was about five years old, I guess. I can remember him going--there was one tavern there. I can remember him going in there, and I could go in with him, but I had to sit way in the back. They had a bench back there in the back, and I sat back there and waited for him. And we'd go to get groceries at John Dam's Grocery Store. He had a partner, too, but I don't remember what his name was. That's about all I can remember about the downtown. Bauman: Do you remember any other institutions, any other churches or anything along those lines? Bauman: Okay. How about any community events? Do you remember any special occasion? Johnson: The only thing I can remember is, they used to have--farmers have something called a chivaree. And I don't know if all that was when people were getting married or something of that nature, I guess. That's all I can remember about that. Wasn't too lively around here, then. Johnson: Yeah. There was a guy named--another Richland farmer--his last name was Murray. One of them was Brainerd and the other one was Audemar. No, Brainerd and I can't remember the other one. But I don't know if Brainerd was the son or the father. But they bought about, oh, all the way from Fourth Avenue up in Kennewick up to about what would have been Seventh Avenue right now. He bought that whole thing. And people from Richland started buying. I know there was--the Ericksons bought land there, and the Northings bought land there, the Samses bought land there. And there might have been a couple more, but there was a lot of Richland people bought five and ten acres. I know my grandpa bought five. And the bottom part of his went halfway from Rainier halfway to Vancouver—no, Olympia, through Olympia. And then John Erickson bought the land. And then just south of us the Northings bought the next whole ten acres there. Oh, there was quite a few Richland people there. Bauman: I want to ask then, growing up you said there wasn't a whole lot going on in Richland. Johnson: [LAUGHTER] No, not that I knew of. Bauman: [LAUGHTER] Yeah, as a young child, obviously. What sorts of things did you do for fun or for entertainment? Did you go swimming in the river, or did you do hunting, fishing sorts of things? Johnson: Well, when I was little, we get a little irrigation ditch that run through our place. We called it the lateral, come off the big ditch. And it was probably maybe a foot and a half deep. Me and my cousin used to go play in that all time. I was interested in rocks, and my grandma used to take me out there in the desert and we'd hunt for pretty rocks. And there was an awful lot of sand. I remember, when the wind would blow there you didn't have dust storms you have sandstorms. And that hurt when we were out in that. In fact, a lot of our cars got the windows pitted from the sand. I can remember big sand dunes out there. And I used to go out there with my cousins once in a while. Like I say, there wasn't a whole lot going on. I was too young to do any sports or anything. I can remember my cousin that was seven years older than me. Brewer, Max Brewer. He'd go hunting out there. And one exciting thing I remember, he was hunting with Verne McGan, I think it was. And his gun went off and hit Verne in the shoulder. That was a big, exciting thing. [LAUGHTER] It was a .22 so it didn't do a whole lot of damage. But still, pretty exciting. Oh, and I remember one thing, too. After the Navy put that base in Pasco, they had those trainers. Planes, training pilots, they were yellow, and they were double-wing--one over the top of the other. And they had two open cockpits in them, is what they were. And they used to come down so low that my dog would get up on a haystack and bark at them, they'd come in so low. And two of them crashed out there between us and Brewers’ one time. One of them crashed, and the other one tried to land in the sagebrush. And he couldn’t land one of those in the sagebrush, so. There's parts all over out there. And I heard some of the farmer used to shoot at them with shotguns. They'd come down so low they'd go underneath the telephone wires. Johnson: So it's just a bunch of young guys learning to fly. But they were over there all the time. Bauman: So did that start like in '42 or '43? Bauman: Did you ever talk with your mom or your grandparents later about leaving, and what their perspective was on that? Johnson: Well, they weren't real happy about it, like I said. Most of the farmers were really unhappy about it. My grandfather, he was from Norway, so he just thought that was the way things went. He went to work for some company who was building Big Pasco over there. And then in 1947, he went to work for DuPont. And I think he only worked for DuPont for about six months, then DuPont left and General Electric took over. And he thought that was great. Best job he ever had, he said. He was a teamster. He drove from central stores to 300 Area. He delivered the things that were ordered for the 300 Area from central stores. Bauman: Do you know how long he did that? Bauman: Did anyone else from your family work at Hanford at all? Johnson: Yeah. My mother's cousin's husband, Lawrence Brewer, worked out there. And let's see, who else did? Must be somebody else, but I can't remember who they are. Oh, yeah, they were neighbors, I remember some neighbors that worked out there. And I think you said you talked to one of them. Gordon Kaas, or Norman Kaas. Johnson: Yeah, he worked out there. I don't think Norman did. Bauman: Right, Gordon did. That's right. You said your grandfather enjoyed the job working out there, right? Did it seem strange at all, working at the place where you used to have a farm? Johnson: No, not to him. He thought General Electric was a fabulous place to work. Because he was from Norway and he'd worked in real hard jobs. Sawmill, and stuff like that. This is just driving a truck from central stores to 300 Area, and he thought it was great. Bauman: Now have you or any of your family members had a chance to go back at some point later and see the place at all? Johnson: No. Well, my sister's oldest daughter got to go out there to our old farm one time. I talked to her the other day and said I'd like to go out there. And she said she’d try and get ahold of somebody. But I don't think she has. But they never lived out there. I'm the only one left alive in our family that lived out there on either one of those farms. My cousin just died, last summer. She was five years older than me. So here and I were the last ones, and it's just me now. Bauman: And who was your cousin? Johnson: Donna Bowder. And they lived over there up in Meadow Springs. Johnson: Anything history is worth keeping, I think. We shouldn't lose our history on anything, I don't think. There should be a lot of people left, descendants of the people that came out here. I'm sure they would like to know what their grandparents did. I think it's very interesting, really. 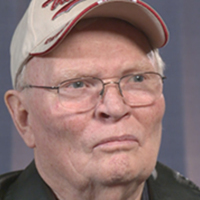 Bauman: Were there any special memories that you have from--and I know you were very young when you moved away to Kennewick--Were there any special memories you have from the time you did live on the farm in Richland that sort of stand out to you that you haven't mentioned yet? Johnson: Well, I can remember my cousin, the one that just died, her and I used to have to pick a row of strawberries. And then my grandma would let us go play in the irrigation ditch. And that was a big deal for me. Let's see, I was about five years old at that point. Bauman: That was your reward? Johnson: Yeah. [LAUGHTER] Yeah, yeah. Bauman: I was going to ask you, did you have any certain chores or things that you had to do to help out? Johnson: Yeah, I had a little car, a pedal car, but it was pretty hard to pedal in the sand. [LAUGHTER] And I can remember having electric trains, like that. One thing I remember about the house was the front room was real long. In those days we didn't have carpet, we had linoleum. And I had a little dog, a fox terrier, and I'd throw that ball in that front room, and he'd just chase it, and he'd just spin. And then he couldn't stop and he'd smack right into the wall. [LAUGHTER] So I had a lot of fun with that. Bauman: [LAUGHTER] Yeah. I guess the dog kept doing it, so he must have been having fun too. Bauman: Anything else that I haven’t asked you about? Or anything else that sort of stands out, either your own memory, or maybe if you have any stories that your mother told or your grandparents told you. Bauman: Yeah, my grandpa used to tell me stories all time. He said they used to have down in the Columbia River—of course was it was a lot swifter than it is now because the McNary Dam wasn’t there. They had what they called a boom out there. It was a big log that was long, that was out there and it would catch all the driftwood. And they'd go down there for firewood, I guess is what they’d use it for. And he said he went down one time and they were netting salmon. And he said he come back with a whole backseat full of salmon in his old car. And he said they use to catch sturgeon down there about 12 feet long. And they'd hook the line onto a team of horses and drag them out of the river. That's a big fish. 12 feet long sturgeon. Johnson: That's about all, he never said too much about anything, he just farmed, that's all he did. Never had no hobbies or anything, just farm. Bauman: So have you sort of stayed in the area then, most of your life? Johnson: I went to work for General Electric when I was 18. 1955. And retired from Westinghouse in '94. Worked for four different companies there while I was working. Bauman: And so when you start working for GE, what sort of work were you doing? Johnson: I was only--when I was 18, you couldn't really get too much. The job I was working in a printing shop in the 700 Area. And then later I got a job with the Richland Fire Department for two years. At that No. 1 station on George Washington Way. And then when the city took over in '59, I thought I'd be better off staying with General Electric than the city. So I got a job as an operator out at 100-D Area. And I worked there until they shut DR down, which is the other reactor at D Area. And they sent me to H Area, and I worked there until they shut it down. And I worked-- then they sent me to F Area. And I worked there until they shut it down. Then there was an old powerhouse in town that supplied steam to the Desert Inn and all the schools and everything. And I worked in there until the Federal Building was built, then they shut off all the steam. Then I got laid off from General Electric, and it was just awful. They were leaving then. They left, and then the only thing here that was General Electric was N Area for a while. And a company called Douglas United Nuclear come in and took over the 100 Areas. And I had been off work about three weeks, and they called me up and wanted to know if I wanted to come work for them, which I did. So I went out to B Area. Bauman: B Area, is that what you said? Johnson: And then I come into town and I worked in the 300 Area. And then when they shut B Area down, I put in an application--I was down low on the seniority list--so I put in an application in with Battelle. And they offered me a job in I think it was June of '67. So I quit United Nuclear to work with Battelle. And then when Battelle--Westinghouse came in in 1970. The building I was working in, and my manager was going through Westinghouse so I had a choice, I went to Westinghouse too. And I worked for them from 1970 to '94. In the 300 Area. Bauman: Wow. Hm. So altogether almost 30 years. Johnson: I was there 39. A little over 39 years. Bauman: Right, right almost 40 years, right. So you worked at D Reactor, you said? Johnson: I worked in water department. Bauman: Oh, the water department, okay. And so what sorts of jobs or tasks did you have there? Johnson: Well, there was a lot of jobs in pump rooms. I worked on the filter plant. And what we did, we pumped the water out of the river and up to the 183 building, which was a filter plant. And then we treated it with some stuff that I can't remember the names of. And then we filtered it and sent it down to 190 buildings, which had all the--They had eight synchronous electric pumps in there. And they'd pump the water from there through the reactor to cool the reactor. Now remember I was on just shift work with 22 operators on each shift at that point. And then there was a few on day shift to relieve people. A lot of people out there then. The department I was in had over 500 employees when I went to work. The Power Department, they'd call it. And when I retired it was about 150 of us, I think. Bauman: Wow. I assume you needed to have security clearance of some sort? Johnson: Yeah, I had Q clearance most of the time, yes. Bauman: Were you ever working in jobs where you had to wear special protective equipment for the possibility of exposure or radiation? Johnson: Yeah, the last 15 years out there I went to what they called air balance. We did in-place testing of the heat for filters that filtered the air before it was released to the atmosphere. And I got into some pretty hot things a few times. Changed the set of filters in the 324 Building one time, and it was 350R. They were doing some work in one of the cells for the German government. And they got real crapped out. Bauman: Hm. Roughly what time period would this have been? Johnson: That would have been in probably '86. Probably something like that. Bauman: Oh, okay, okay. And so you have to have dosimeter? Something along those lines? Johnson: Yeah. We had to have rings on for it. And I had two dosimeters, one in each front pocket. Had two pair of coveralls on, and shoe covers, and then boots over that. Then you had a skull cap on and a hood over that. And then you had assault mask that covered your whole face. You had two pair of gloves--you put surgical gloves on and then canner gloves on. And these were all taped to your outer pair of coveralls. And then they went around and taped everything that was showing. So there was no skin showing. Johnson: You mean for exposure? Johnson: I never was in there where I had to come out for overexposure. They tried to keep it as low as you could get. And so it wasn't that bad. The only time that there was ever any much exposure was when we were testing some of the filters. Some of them would have hot places. Or when we were changing filters. They had the millwrights or the fitters come in and change them, and we had to be there to test them. And that was the only real hot thing I was around. One time I remember in 325 Building, we were in a hot room in the basement. And we had to take these caps off of the duct-work to inject the smoke in there. And when the guy was taking it off, it just all of a sudden, it felt like it was heavy. It fell down and this, it looked like gunpowder, went all over everything. So we spent a whole day in the whole-body counter downtown after that. So that wasn't no fun. [LAUGHTER] But nobody got anything. I didn't get anything. They just wanted to make sure that we didn't get anything. Because that stuff that come out was pretty hot, I guess. Bauman: I imagine safety pretty strongly emphasize at Hanford, in terms of procedures? Johnson: Oh, yeah. Especially got, towards the end that I was there, procedure compliance was the main thing. If you didn't follow procedures, some people lost their jobs because of that. And I remember one time, I usually run the machine that detected how bad the filters were leaking, and we got some new ones in. The old ones had just push buttons on them, and the new ones had toggle switches. And we were going to do a job one time, and they had only wrote a procedure for one of them. The push buttons, not the toggle switches. So we had to quit. We couldn't finish the job. Which I thought was really stupid. What difference does it make whether you push a button or flip a toggle switch? But they had to write another procedure for it. So that got kind of irritating. It was hard to get used to that. Where you used to go in there and get a job done, and after the procedure compliance came along, couldn't do that. Took three times as long to do a job. Bauman: Obviously when you started in 1955, focus was on production, and by the time you retired, definitely the focus was on cleanup. I wonder if that shift, how you saw that, impacted your work, maybe? Bauman: President Kennedy visited the site in '63 to, I believe, the N Reactor. Were you here? Did you happen to be on site at the day? Johnson: I was here, but I was working graveyard, and I didn't feel like staying up that long to go see him. Bauman: [LAUGHTER] That make sense. Bauman: Were there any significant incidents, events sort of things that stand out in your mind from your years working at Hanford, that you remember? Johnson: Well, when I worked on fire department, I was the youngest guy there. Actually I was 20 years old when I went to work on the fire department. And I used to have to ride the back of that truck. And when you'd have a fire—and we had a lot of false alarms, these kids would pull them pull-boxes all over town-- but you had to respond just like it was a real fire. And a lot of them we'd get was at the Bomber Bowl, you know, after a football game. But you'd be in bed, asleep, in the winter time. And then all of the sudden all the lights would come on and those bells will go bong, bong, like that. And you're just in a fog up out of there. And then you hit that cold air out there and it was a real shock. In fact I talked to a guy that works on the Seattle Fire Department, and I told him. He said, oh, they wouldn't let you do that no more. They don't let you ride the back of that truck. He asked me if we were tied on. I said no, we hung on pretty hard, though. You just had to, back there. But it was a good place to work. I really did like it. Before I retired it was not near as good. Because I was one of the youngest guys out there in my department. And most of the other older guys that I've worked with had either died or retired. So it wasn't the same. Bauman: What--of the different jobs you had at Hanford, different parts of the site that you worked, was there a job that you found the most rewarding? That you enjoyed the most, or one maybe that you found the most challenging? Johnson: The last one I had, the air balance job was. There was a lot of math in it, you had to figure out air flows, and you had take air flows. We had to test--they had open-faced hoods in there. And we had to check them--I think we checked them once a month to make sure the flow was up to standard. And I know one of the guys who was vice president out there when he retired. He used to see us, he'd stop and tell us that what you're doing is more important than any other job out here. You're keeping people safe, he said. I really appreciated that, that the vice president would notice us. But that was the best. I thought that was the most challenging job I had out there. You had to use your brain a little bit, and all that stuff. Bauman: You started to talk about this a little bit, maybe I'll ask you to talk about it a little more. So how was Hanford as a place to work? What overall are your impressions of your almost 40 years working there? Johnson: I thought it was really a fairly safe place to work, really. As far as the jobs I had, they were real careful about everything. I know my uncle took me through a plywood plant in Longview one time. The safety wasn't near as good there as it was on Hanford. It was easy to see that. It was a good job, really. As it went on you had to go through more things. They're always sending you to a class that didn't help you a bit, I didn't think. [LAUGHTER] But it was a good place to work. Bauman: I teach a class on the Cold War, and the of course, a number of the students that I have in my class were born after the Cold War ended. And so have no memories at all of the Cold War. Of course you were working at Hanford-- much of time you were working at Hanford was during the Cold War. So I wonder for young people today or future generations, how would you describe working at Hanford during this period of the Cold War, explain to them what that was like? Johnson: Well, it was-- I don't know how you would say it. It's a good place to work. They take real good care of you up there, I thought they did. The only thing I didn't like about it was shift work. I didn’t care for that. [LAUGHTER] My wife used to tell when I was coming towards the end of graveyard, she'd say well you're getting to be halfway decent to live with again. We changed shifts. We didn't work one straight shift. You work a week of swing, and a week of graveyard, and a week of days. Terrible shift. Anything would have been better than that. But I would say, if you don't mind shift work, it was great. Because I was lucky I ended up, when I went to work at Battelle I got day shift most of the time. But they were good people to work for. Pretty honest, people were out there. They all had Q Clearances, and so they had to be pretty reputable people to work there. So that was nice to work with people you trust and depend on. And it was all around a good place to work for me. I'm not sure how it is now. But I have a relatives out there now. Quite a few of them. Bauman: Is there anything I haven't asked you about in terms of your work at Hanford? Or anything you haven't had a chance to talk about yet, but you'd like to talk about? Johnson: I can't think of any now, I probably will when I get home. [LAUGHTER] I can't think of it now. [LAUGHTER] Some stuff comes back to me every once in a while that I don't think of all the time. There's a lot of funny things that happened out there. I remember one time the guys at my supervisor on graveyard, they'd always go dump their garbage out of their office. And it was still dark out, and he dumped it and a raccoon come out. About scared him to death, I guess [LAUGHTER] I remember one time they had to knock the reactor down when raccoons got in there where the transformers were. And he jumped from one to the other one, well it zapped him right in midair. So it knocked the reactor down. So there was a few funny things that did happen. Bauman: Well, I want to thank you very much for coming in today and sharing your memories, both about your childhood in Richland and also your years working at Hanford. I appreciate it. 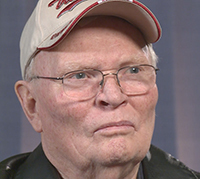 Hanford Oral History Project at Washington State University Tri-Cities, “Interview with Norman Johnson,” Hanford History Project, accessed April 22, 2019, http://www.hanfordhistory.com/items/show/56.